Just a little ‘Something for the Weekend’. In the days before children, Ed used to often make something like this on a Friday night after work. Something to tide us over until dinner. The truth of the matter was, once we’d had this and a few beers, we rarely got round to bothering with dinner. Now if we have it it’s more of a lunchtime thing and a good standby when you haven’t been shopping but have eggs-a-plenty. A good one for all you chicken owners that I am slightly envious of. Allow to cool a little then slice up and eat it with your fingers and preferably an ice cool beer. Enjoy the sunshine this Weekend, people. mmmmmm will definitely be trying this one – we ate this on our hols in Norfolk! 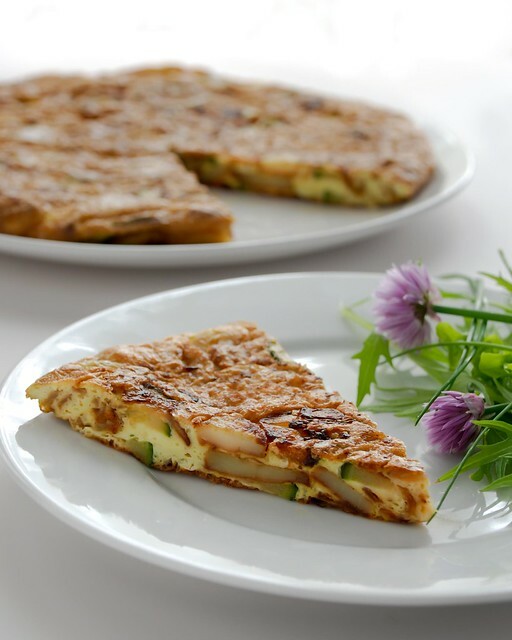 I grew up in Spain, so I LOVE tortilla de patata. It’s been waaay too long since I’ve made it–thanks for the prod. Ah, you make it sound so easy. I bet I’d lose mine mid-flip! I love how simple this looks though, maybe I’ll work up the nerve. A lovely totilla! Perfect with a seasonal salad. Oh how delicious this sounds …. just in time for the weekend! Now I must find my cooking groove again! 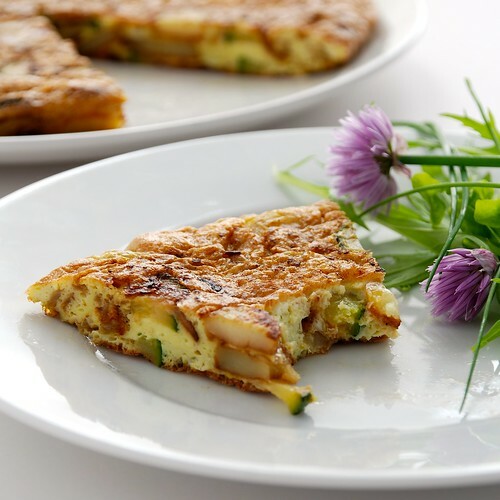 Potatoes, veggies, eggs and cold beer — this sounds awesome (and easy!). I would add bacon! Thanks for sharing!